Hinsdale Home – Project Underway! It always seems that once we complete one project in a client’s home, we end up moving through their entire home, or at least one floor to begin with! And it’s no different with this project. Our clients came to us with a request to give them an updated look for their kitchen. Once that was completed, the results were so fantastic and the clients loved it and felt that since the process was so fast and smooth, and they loved the end result, they wanted to continue working with us for their next project. It was not long before they contacted us again to start their powder room project. 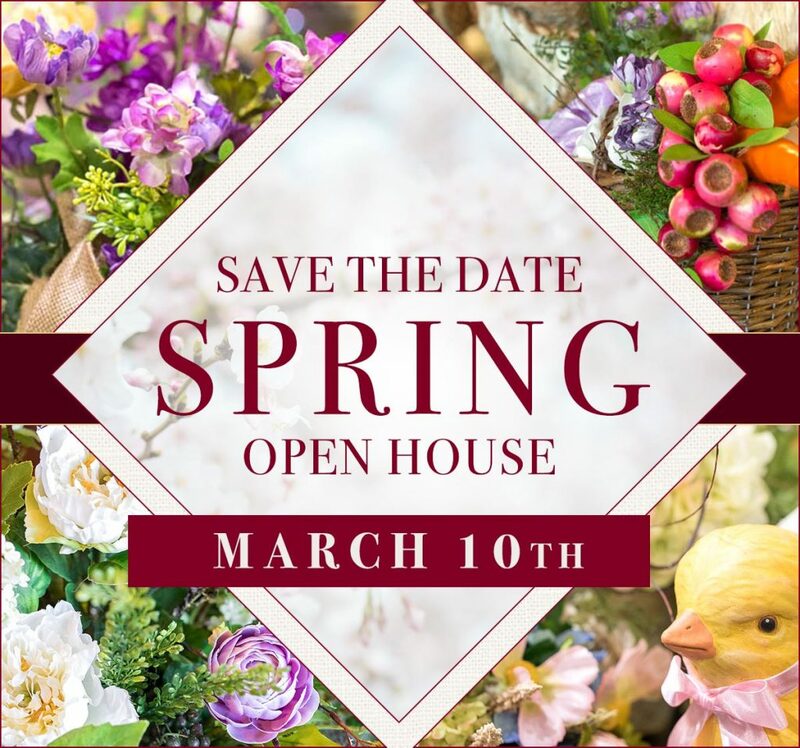 We were so excited to hear from them again, as we had an absolutely fabulous time working with these clients. They were looking for something to tie in with their updated kitchen, as the powder room is adjacent and they wanted their home to have a nice flow. Step one in our game plan: take down that wallpaper! We are sure that at one point this color palette and themed wallpaper was in everyone’s home. It was THE THING that was en vogue 15 years ago, but not anymore. 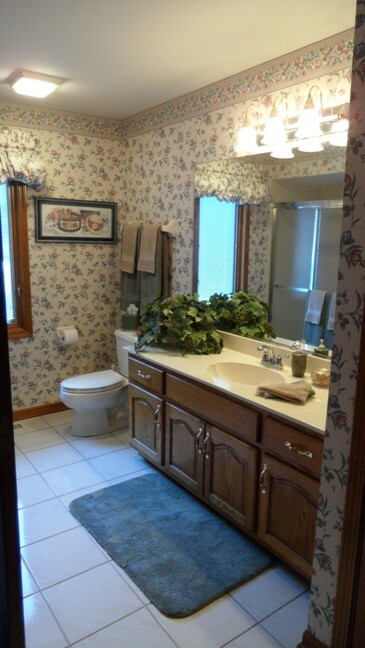 Some of us still remember the times when we all had avocado-colored toilets and sinks, and flowered wall paper with matching towels, floor mats and window treatments! Considering all that, this wasn’t really that bad. So all we had to do was get rid of the wallpaper for the room to be able to breathe again. 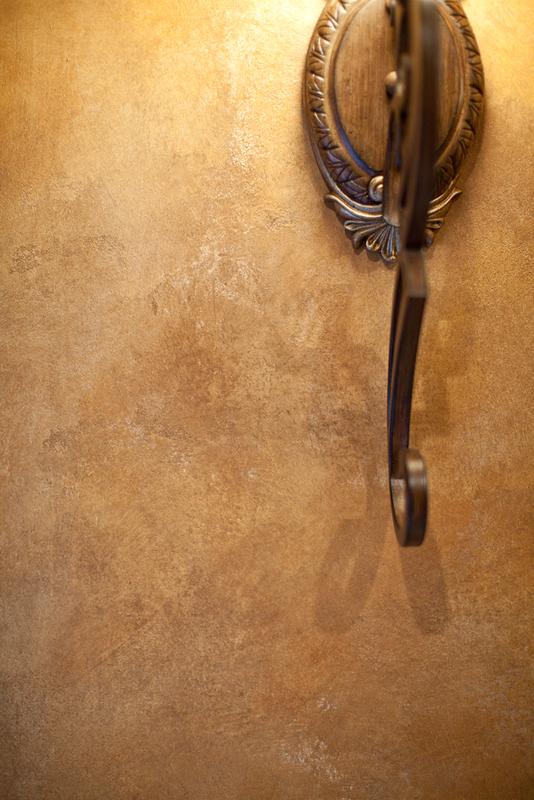 We did a beautiful smooth Venetian plaster on the walls to create warmth without using a pattern. Our clients also wanted to make sure if they ever chose to repaint it, they wouldn’t have to sand their walls or even worse, replace their drywall. Using a smooth Venetian plaster was the best way to accomplish the sophistication that a textured wall brings, without the commitment of fully refinishing their walls down the road. They loved that idea! 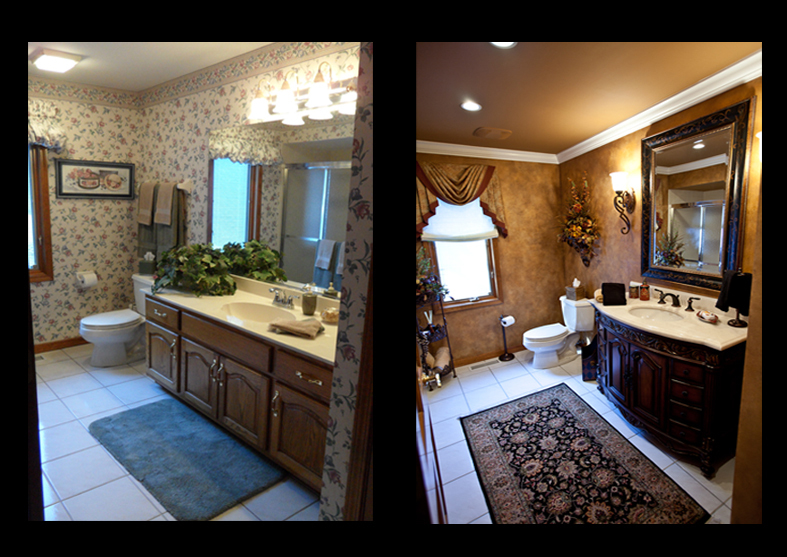 Once the wallpaper was down and we dressed the walls with a beautiful Tuscan finish, it was obvious that their existing vanity, mirror, and dated light fixture had to go as well. We had a blast taking it all down! We also thought that their existing vanity was WAY too big for a room that served only as a powered room; and even though it technically is a full bath, our clients never used it as such, as it is on the main floor of their home. So we decided to scale it down and make the vanity more free-floating in the room with space around it, versus tucked in the corner. It gives the space more of an open and formal look. 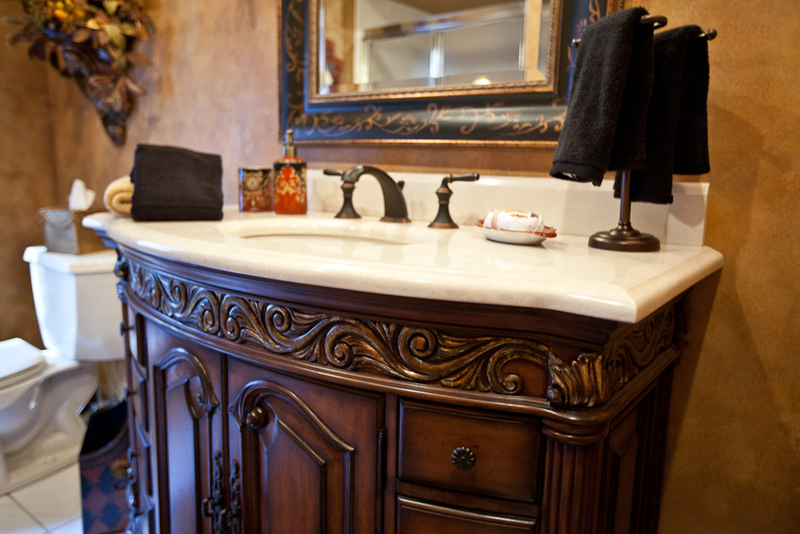 We chose this hand-carved walnut vanity with antique gold leafing on the carvings, finished with a Crema Marfil marble counter top, porcelain sink, and Oil Rubbed Bronze fixtures. With having only one window in the room, we decided to dress it up without taking the focus off of the rest of the space. We feel we accomplished that by using a main fabric that is similar in tone to the wall finish. We didn’t want it to completely disappear into the walls, therefore our finishing touch was this beautiful copper solid-color bending along the leading edge of our treatment. It is a bathroom after all, and privacy is a must but blinds or shutters wouldn’t do it for us. 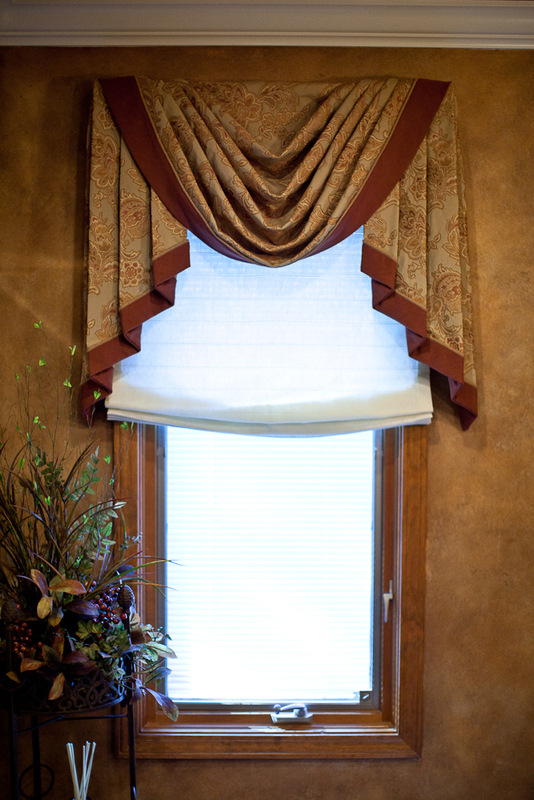 A soft Roman shade made from a sheer fabric, and lined for privacy, was the icing on the cake and it did the job! 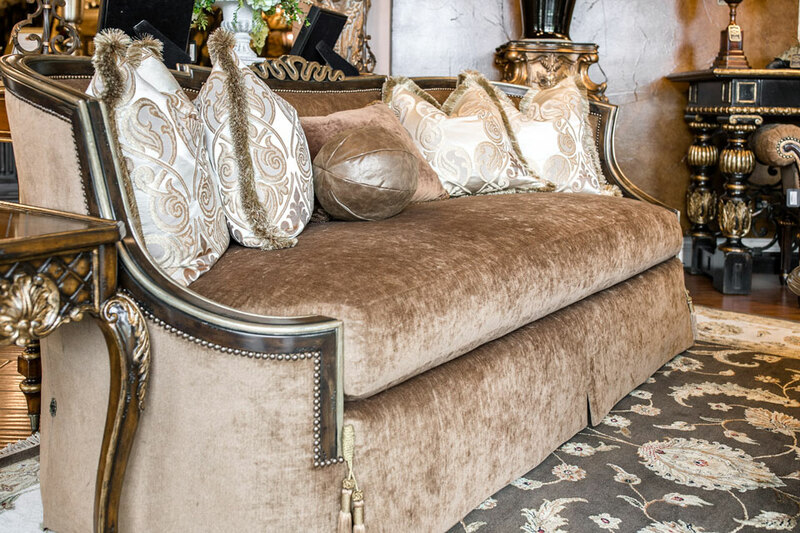 Anytime we have an opportunity to add an architectural detail to a room, we just go for it. In this case, it was our 4 1/2″ Colonial-style crown molding. Since our client decided to keep her existing cream tile on the floor, we thought that having white decorative trim along the ceiling would tie all the levels of the space together. 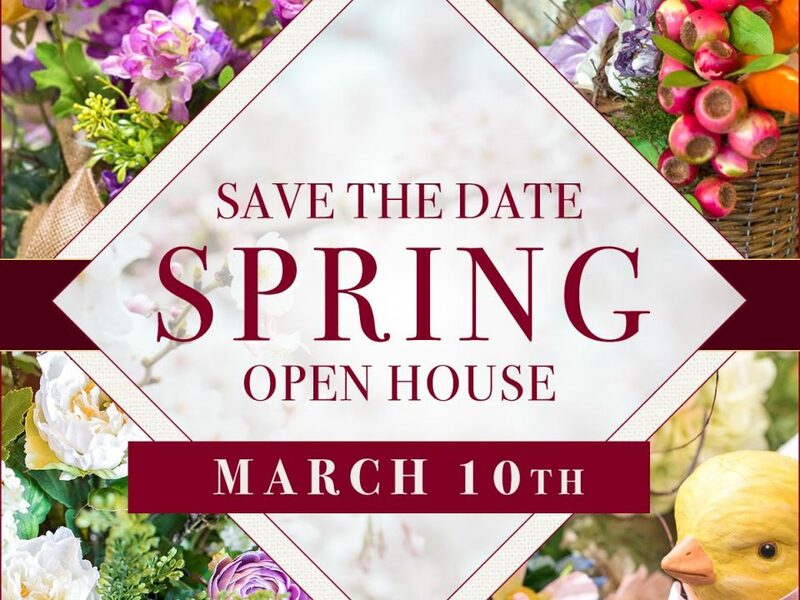 We have accomplished a beautiful, timeless look and added another very happy client to Linly Designs’ ever-growing list of satisfied customers!